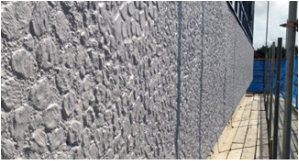 We were contacted by Eaton Aerospace to investigate the delaminating of precast panels to the external walls on one of their main office blocks. After surveying the panels we concluded the best method of repair would be to stitch drill the them using an anchored stainless steel bar resin. Once secured the resin was injected into the panels. 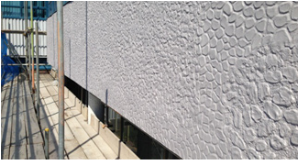 We then carefully broke out all defective concrete and treated the steels using a Flexcrete structural grade mortar which was applied in layers, we then matched the existing pattern which was worked and formed into the new mortar. 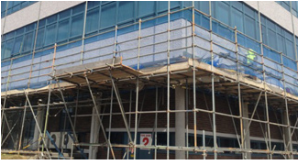 Once all repairs to the external panels were completed a flexible anti-carbonation coating was applied for protection.